First posted 25 January 2010 on Liquorature. The Renegade line of rums is as clear a statement as any, that packaging sells: their bottles are so curiously different that one is almost compelled to take a closer look when one sees them on the shelves…and having seen, the itch to go spend some cash becomes an incessant feeling that must be assuaged. Or so I felt when I first saw them: that frosted glass bottle with the rich copper-bronze liquid swirling heavily within just makes me burn to blow some bucks, honestly. And it wasn’t a poor purchase either. As I’ve noted in my review of the Trinidad 1991, Renegade Rums takes stocks from Caribbean distilleries old or closed, and matures them in oak barrels, then finishes them off in French oak casks that may have held Madeira, port, or wine. Their bottling runs are very small, numbering fewer than 2000 bottles. Because of this process, their rums have a characteristic whiskey finish quite unlike a “normal” rum, and are not as sweet – though I imagine dedicated whiskey drinkers will disagree vehemently and shudder as they reach for their single malts. 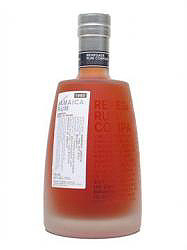 This Jamaican edition from 2000, originating from the Hampden distillery, was a selection for the November 2009 book club. As before, it has been aged in an American Oak bourbon cask, then enhanced for a period of less than a year in French Oak infused by Barac sweet wine (the bottle says Chateau Climens casks). For an 8-yer old, the nose is impressive, redolent of bourbon and then wine, and more complex yet the more I sniffed it. The taste is of bourbon, mixed with apples and perhaps, just perhaps, a whiff of licorice, and it’s not overly smooth – still, to my mind it’s giving the Renegade Trinidad 1991 some serious competition. However, the finish spoils it somewhat, since it tastes the faintest bit bitter. Renegade suggests drinking it neat, but the truth is, it’s a little too harsh for that, and I didn’t care for the not-quite-mellow whiskey-sour-fruit aftertaste. There’s a reason I favour rums over whiskey (quite aside from my background and history). It’s not bad, just not top of the line, and while the first impression is positive, I can’t say the finish is worth it, though whiskey drinkers will likely castigate me most thoroughly for this bit of barbarism. (If memory serves, the club appreciated it, just not to the point of leaving it unmixed).